"What a truly lovely place, took my Cavachon here to be groomed and the service was so lovely, really pleased at how he was looked after....see you in eight weeks!" Your dog will leave Fido & Felix looking clean and pristine, and feeling happier. Situated in Great Linford, Milton Keynes, we provide a full range of dog grooming services as part of our professional care. With our wide variety of treatments, we ensure that your beloved pet receives only the best. Fido & Felix is located on the Wolverton Road opposite the popular Black Horse Inn. With plenty of spacious parking facilities, you can rest assured that you will have no problem finding space when you bring your pet to us for professional grooming and care. We also offer a vast selection of quality pet and food products. Please feel free to visit us so you can see our excellent facilities and great customer service for yourself. Prices depend upon the condition of your dog’s coat along with its temperament, and are available on request. 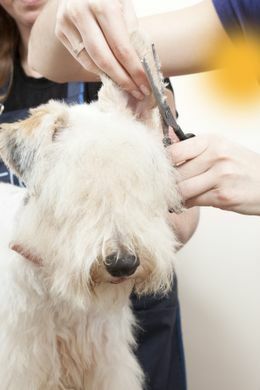 Nail trimming is included with a full grooming session. As most of you will be aware, we did offer a grooming service within the shop, however, this was not operated by us but by a 3rd party. Now that this person has moved on, we are not able to provide a grooming service at the moment. Contact us in Great Linford, Milton Keynes, to discover more about our dog and cat grooming services.